The Waltons TV series began in 1972, celebrating its 40 year anniversary this year. The family drama still airs on TV currently running on the Hallmark Channel, INSP and GMC. Last week I shared my review of the book Lessons from the Mountain, actress Mary McDonough's autobiography from 2011. Click HERE for the link to the book review. The much loved family drama The Waltons celebrates its 40 year anniversary with an elaborate cast reunion this Saturday, September 29th in Los Angeles. Though I won't be attending, I thought I'd remind fans of the Christmas episodes of that series. 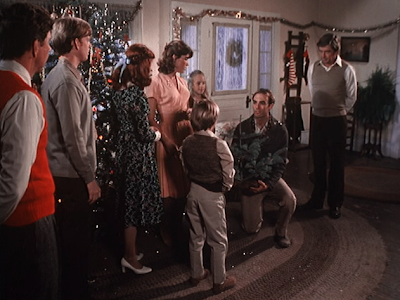 I have previously blogged about the 1971 Christmas TV movie The Homecoming and The Waltons episodes 1976's The Best Christmas, 1977's The Children's Carol and 1978's Day of Infamy. Click on the titles to see those blog posts again. Isn't it great when a TV series creates many holiday installments over the years? 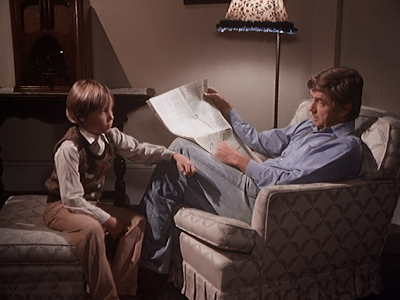 Today I'm happy to share about the 1979 Christmas episode of The Waltons entitled "The Spirit." This last Christmas episode of the series takes place later in the run of the series. Above, Erin sits with Cindy, Ben's wife who is expecting their first child. 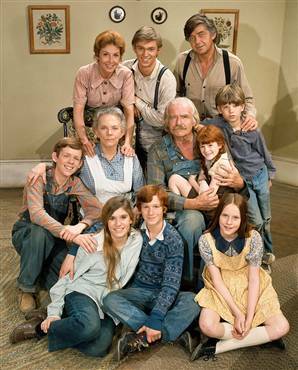 By the eighth season of The Waltons, there were several changes made to the cast. Cousin Rose Burton and her two grandchildren, Serena and Jeffrey, were added, as was Ben's new wife Cindy. This eighth season episode takes place during Christmas 1943. 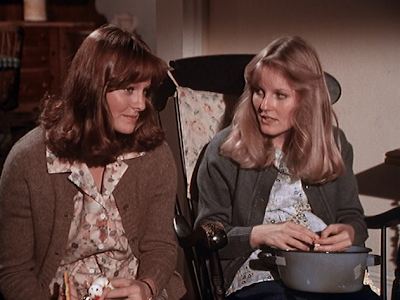 Olivia is not on Walton’s Mountain but off-screen caring for John-Boy who was injured while shot-down from his airplane, serving in World War II. A hungry stranger claiming to be looking for his lost dog shows up at the Baldwin Sisters' front door. The family and others on Walton's Mountain notice that food and other items have gone missing. Ike Godsey's store window is broken but the thief only takes a few items of food and leaves valuables and money untouched. Locals also take notice that there is a shy stranger seen in the area. 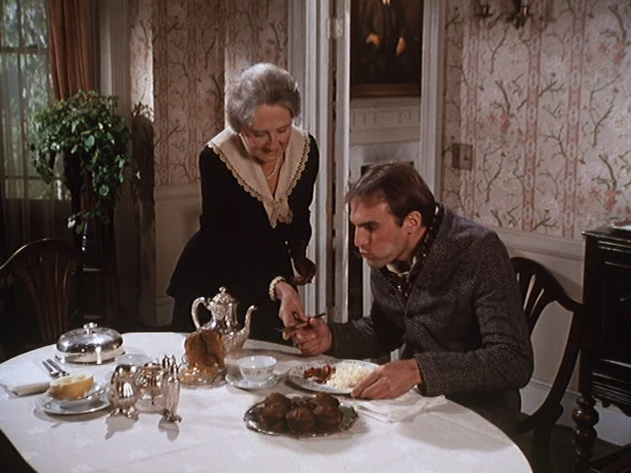 Several of the Waltons family members begin to speculate about whether this stranger is also the thief. John Sr. wonders why an able-bodied man wouldn't work to pay for his food during a time when most companies are hiring since there is a labor shortage. Clearly the residents on the mountain are accustomed to an extremely low crime rate, and the mystery continues. What no one knows is that young Jeffrey has a new secret friend named Paul. 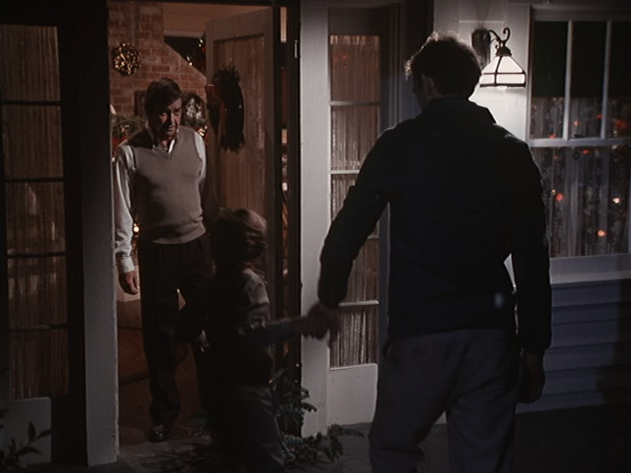 When John hears Jeffrey refer to St. Nicholas, instead of Santa Claus, he suspects that Jeffrey has been talking to someone outside the family. Jim Bob finally discovers Jeffrey in the company of the mysterious stranger but the stranger runs away before Jim Bob can talk to him. The stranger isn't harmful, in fact we see him sharing stories about Christmas with Jeffrey, encouraging the young boy to keep his faith in the traditions of the holiday as he grows older, and he even teaches Jeffrey how to carve a whistle. Jim Bob finally discovers Paul but he runs away before Jim Bob can talk to him. 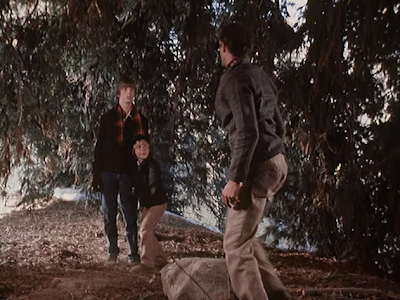 Without ever turning creepy or threatening, this story continues as the Waltons try to find out who Jeffrey's new friend could be. Common sense tells them he may be an AWOL soldier hiding from the military police. John encourages Jeffrey to invite the lonely, hungry stranger to the Walton's home on Christmas Eve but when Paul shows up, they discover Paul has a unique story--he's not who they expected! John finds Paul standing on the porch on Christmas Eve and invites him into their home. Paul has brought a little tree for Jeffrey and shares a story about Martin Luther and the legend of the first Christmas tree. It turns out Paul has a complex situation. He is actually an escaped German POW from a camp in South Carolina. However, Paul is also an American, born in Milwaukee--his immigrant family moved back to Germany when he was a boy and Paul was drafted into the German army during the war. 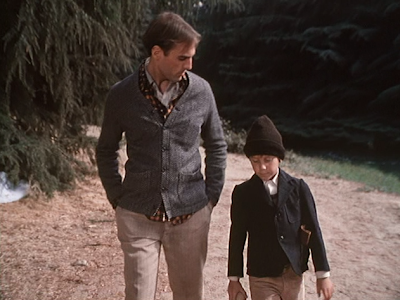 Since his escape from the POW camp, Paul wanders around aimlessly, missing his family. Recognizing he has no way to return to his family, Paul now wishes to return to the POW camp. Seeing Paul as a gentle soul and acknowledging that it was a German fishing boat that rescued John-Boy from his plane after it was shot down, the family agrees to offer Paul their compassion. I really like this episode quite a bit. 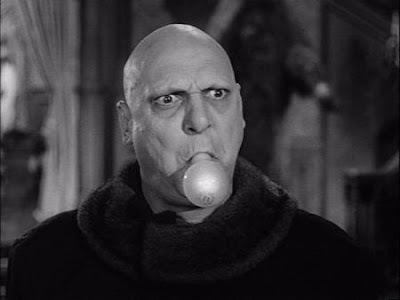 It isn't predictable and the mystery of the stranger's identity takes the full length of the episode. Yet TV viewers see that Paul is not a dangerous person. Though 21st century viewers may be trained to assume any stranger is a threat, here the story allows a far more innocent storyline to unfold. Paul's influence on Jeffrey is a good one as the young boy struggles with how to re-connect with the meaning of Christmas after over-hearing there is no Santa Claus. In every Waltons Christmas episode, you can expect to see the family gathered together singing carols. Here, Jason leads the family singing "O Christmas Tree" as they begin their Christmas Eve celebration. The details within the episode make for a fuller, richer experience of the story. 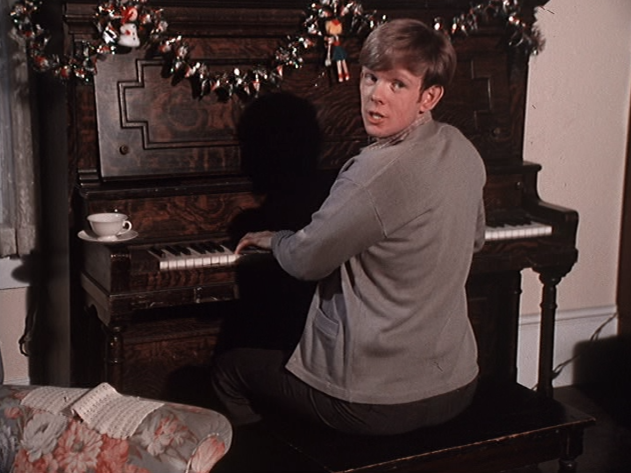 When Paul steps up onto the Waltons' porch on Christmas Eve uncertain if he should reveal his identity, Paul can hear the family inside singing "O Christmas Tree" as they decorate their tree. Of course, this song has a long German tradition which may well have sparked even more of an emotional response from Paul who misses his family deeply. The mostly forgotten 1950s dramatic anthology Crossroads includes an episode that also incorporates the legend of the first Christmas tree and its connection to Martin Luther. Paul brings young Jeffery a small fir tree and shares with him the legend of the first Christmas tree--a story about Martin Luther, the German theologian credited with the Protestant Reformation. If you've never heard this story before, it's worth investigating. 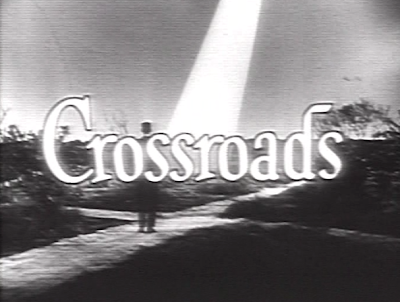 I've also seen it depicted in the 1956 episode "Our First Christmas Tree" of Crossroads, a dramatic anthology TV series based on inspirational stories from the clergy. Did you know this series even existed? Credited in The Waltons series as Keith Mitchell, he is now known as Keith Coogan. This is also a special Christmas episode because it features Jeffrey, played by the young Keith Coogan. TV and movie fans growing up in the 1970s and 1980s may recognize this actor from his many roles, perhaps most notably the movie Adventures in Babysitting from 1987. Though credited in this Waltons episode as Keith Mitchell, the actor currently goes by the name Keith Coogan and is the real-life grandson to actor Jackie Coogan. 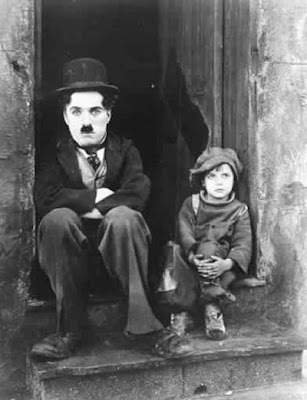 Child actor Jackie Coogan got his start working alongside Charlie Chaplin in the 1921 blockbuster movie The Kid. You may also recognize Jackie Coogan for his 1960s TV role as Uncle Fester from The Addams Family. 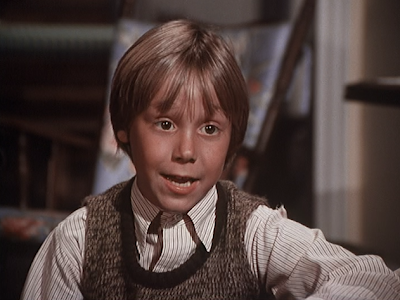 Keith (Mitchell) Coogan is among the many guests scheduled to appear at The Waltons 40 Anniversary Reunion, Saturday September 29th in Los Angeles. Will you be there too? I guess I have all of lthe Walton's Christmas episodes. Wish they would've had one Christmas episode each year !